● Earth resistivity (ρ) test. ● Earth testing at 20Ω, 200Ω, 2kΩ. ● Earth voltage measuring : 0-300V AC. ● Automatic C spike check. ● Automatic P spike check. 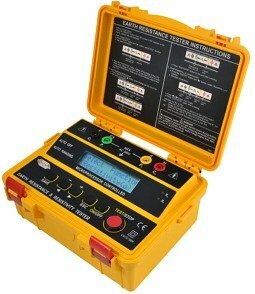 ● 2-Wire test, 3-Wire test, 4-Wire test. and recalled on the display. ● Interval between auxiliary earth spikes is 1.0~50.0m. ● Optical USB to RS-232 data transmission. ● The stored data can be transferred to a PC. ● 2 optical LEDs are built-in for data transfer. & humidity Operating: 0°C~40°C ≤80% R.H.